If you are reading this article most likely you are dealing with infidelity. Whether you are married or in a relationship, the damage that occurs after someone cheats is deep and long-lasting. Only you can take a long hard look at your relationship and decide if it is going to be worth the work it is going to take to revive it. The list of reasons for cheating is long, but one thing that is essential for you to be able to rebuild is, the one who committed the act must be willing to be accountable. This is because no matter what the reason was for the infidelity, it is not the way to solve a problem. Talking to your partner, being honest, and recognizing where you went wrong are all key to saving a relationship. You are most likely feeling devasted, hurt, rejected, and unloved, not to mention your self-confidence has taken a major hit. You will need a lot of extra reassurance until you start to gain back your trust and your partner must be willing to wait for that to happen. The upcoming months and even years can be difficult, to say the least. Together you need to be honest with one another and figure out why this happened. Is there a real problem in the relationship? Are you hiding something that your not comfortable talking about? Does flattery or attention mean so much that you lose control? Whatever was the root cause of the infidelity needs to be seen and dealt with. In a nutshell, the hiding needs to stop and everyone needs to come clean. Forgiving someone who has hurt you is not an easy thing to do. Look at it this way, if you forgive someone you only need do it once, if you don't forgive them and remain angry, you will need to do that every day of your life. Even if you decide not to stay together, for your own health and well being, you will need to find a way to forgive what happened. That being said, most people leave because they will not or cannot forgive. The reason people cannot forgive is that their pride won't let them. They feel that they will be looked down upon or thought of as weak. The truth is, nothing takes more strength and courage than forgiveness. There are cases where the pain is so deep that it feels impossible to just let it go. 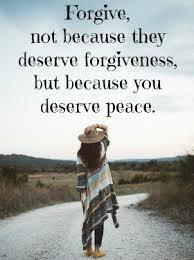 If you just can't forgive it, then decide to forgive yourself for not being able to forgive your partner. If that is your choice make sure you move on with an open heart and release any negative feelings you have for the person who wronged you. It is very easy to fall into a victim role and blame someone else for something that is happening in your life. It may be hard for you to accept that nothing is in your life that you have not played a part in. Maybe this experience was needed to build our own self-confidence or to expect more for yourself, there will be a huge learning as a result of what has happened to you. Take this opportunity to learn from it so that you do not have to live through it again and again. Look at all areas of your life, think about your childhood and your parent's relationship. What did you see and what have you learned to accept by watching them? Has jealousy been an issue for you? If it has it can play a big part in attracting situations that cause more of it. Do you choose relationships for the wrong reasons? Where else in your life are you ok with being 2nd best? The idea here is to get an overall sense of what kind of signal you are putting out into the world. Once you do this you can begin to make changes so that you broadcast a whole new signal. Check out this link to read more about why this happened to you. How Can You Get What You Want? How can you get the kind of relationship you are wanting? Make a list of all the positive attributes you would love a partner to have. Be sure to put the attributes in order of importance. Put it on your nightstand and read it nightly. When you do meet someone keep looking at your list and see how many of the top attributes they possess. Most likely just by making the list, you will find that the new people you meet will automatically have many of the attributes you are wanting. You can do this with your existing partner as well. Yes, it is possible to will changes into others simply by loving and believing in them. The more value you place on them and the more you believe in them, the better they become. Holding a vision of someone for their greater good assists them in reaching it. When I raised my two boys I held a vision in my mind that I never took my eyes off of. I always believed they would be kind, that they would be good, and that we would be close. I never waivered a day no matter what happened. Of course, there were issues along the way, who can raise teenagers without them? But, in my core belief, I held that vision of success for them and it came true. There must be some work on your part as well. You can't treat someone with disrespect, lack of trust, and expect good results. You need to treat them like they are the best even when they are not. What I am really talking about is having compassion. When you can see someone for who they are because of things that they have gone through in their lives, instead of passing judgment on them, then you understand compassion. Compassion makes it possible for you to forgive the impossible. You understand that no one means to hurt anyone and that when they do it is because they do not know any better. No one knows what each person has gone through in their lives from the time they were little up until now. We are all shaped by our life experiences. This is not to make excuses for bad behavior, but all of us at some point need to work on our issues from our past which is causing problems in our lives. For some of us this will gradually happen throughout our lives and for others, they may re-experience the same things over and over never realizing their part in it. If you are on a path to better yourself and grow out of old past patterns then you need to be with someone who wants to do the same. The decision to stay in the relationship should be made based on a sincere knowing that the person who cheated really wants to change and be different. He or she recognizes the tendencies that caused the infidelity and is doing the necessary work on themselves to prevent it from happening again. Without these things in place, you would only be opening yourself up for more of the same.